We covered that Twitter recently updated their iPad Twitter app with a new user experience. Some folks love it, some want the ‘old way’ back. After using it for a while, there are less complaints about the changes. There is a lot of comments about needing better control over our ability to use Twitter effectively. Keep the experience very iPad, but let us get to what we need to quickly and provide the views to info we need with few taps. 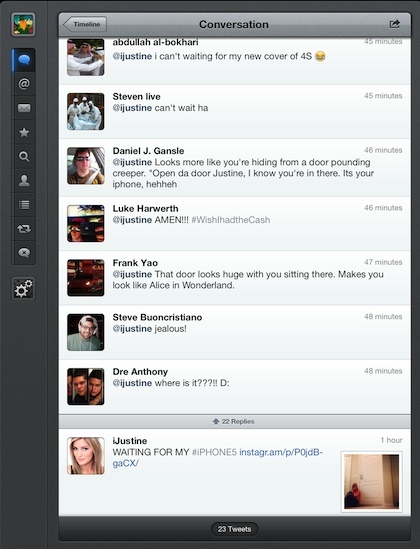 So, we dusted off Tweetbot and remembered why we liked it so much before. We all know someone that follows every person they every find on Twitter. Their tweet stream is being updated so fast there is no way to keep track of what anyone is saying. Then, there are those that keep their list under the golden ‘300’ mark so they track what is important, but miss the other chatter. 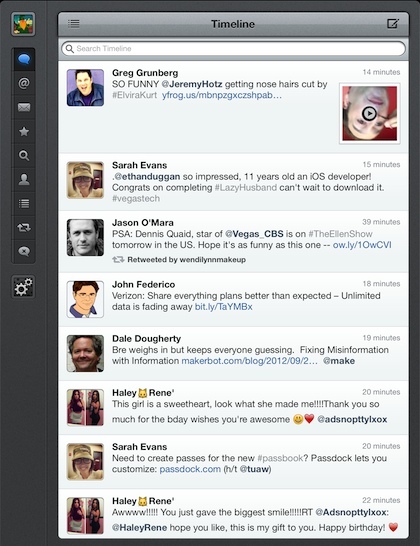 Tweetbot lets you set up different Timelines, then provides the ability to jump between them via one button. Now, have Twitter friends, Twitter co-workers, Twitter news, any groupings you like… the important part is you can get to a workable stream for what matters to you at that moment. Selecting a person takes you to another screen for their core information and recent tweets. 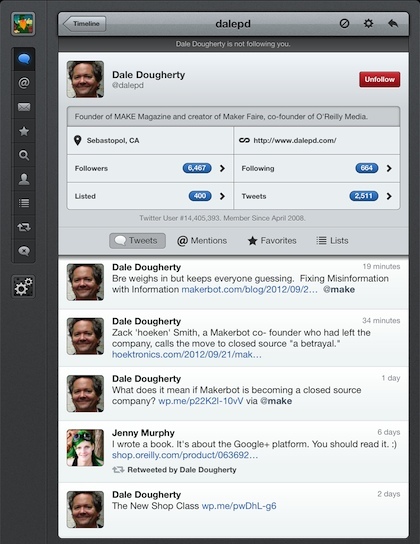 There is not a lot of difference between Tweetbot in this area versus the Twitter app provided by Twitter themselves. The profile image does not have the background image option that Twitter provides so love it or hate it, there is less clutter. Conversations was a difficult area to manage for users with many Twitter connections. Once a person’s friends list got large, it become more burdensome to watch a conversation unfold between the many other posts sweeping by. The Timeline option mentioned above helps, but also Tweetbot allows for a view of all of a conversation to be seen in one scrollable screen. 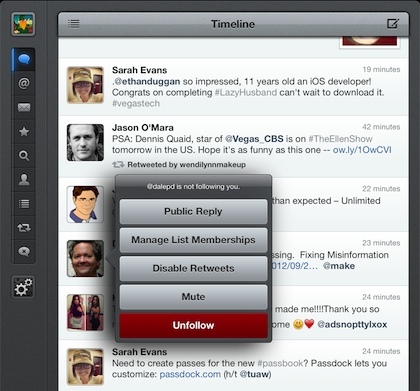 A feature missed by most users that just jump in and start using Tweetbot is the many ‘tapping’ options. Tap and hold a person’s avatar to open up a list of action options. Double tap on a tweet to view details. Triple tap to… well, you choose what customized feature you would like that option to do.